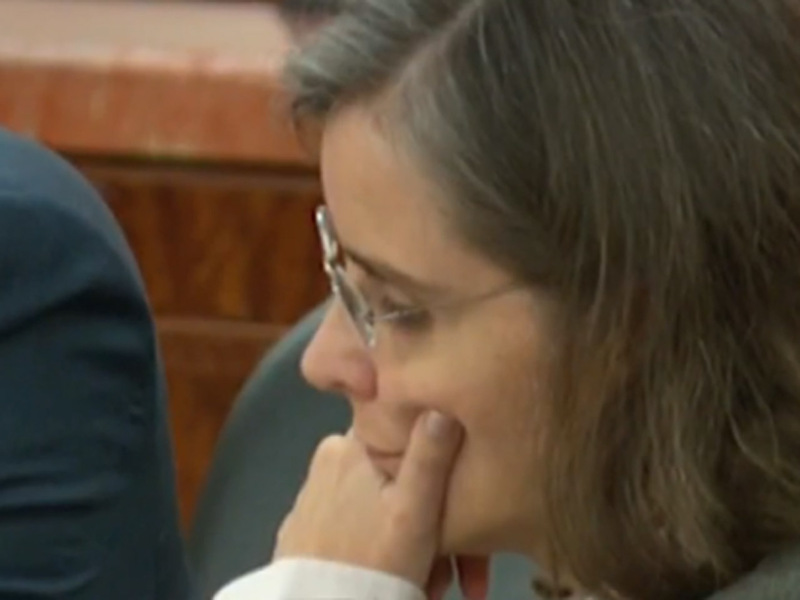 HOUSTON -- A jury on Monday sentenced a Texas cancer researcher to 10 years in prison after she was convicted of poisoning her colleague, who was also her lover, by lacing his coffee with a sweet-tasting chemical found in antifreeze. Dr. Ana Maria Gonzalez-Angulo, 43, a breast cancer doctor based at Houston's famed Texas Medical Center, had been involved in a sexual relationship with her fellow researcher, Dr. George Blumenschein. Prosecutors said the affair turned into a "fatal attraction" and she poisoned him with ethylene glycol after Blumenschein spurned her in favor of Evette Toney, his longtime live-in girlfriend with whom he was trying to start a family. Blumenschein survived the 2013 poisoning. A jury on Friday convicted Gonzalez-Angulo, who is originally from Colombia, of aggravated assault. While prosecutors had asked jurors to sentence her to at least 30 years in prison, they said they were pleased with the jury's decision. Defense attorneys had asked for probation. Prosecutor Justin Keiter said the prison sentence sent a message that whether you are a doctor or anybody else, you will not be treated any differently if convicted of a crime. "It doesn't matter who you are. It matters what you do," he said. Defense attorney Derek Hollingsworth said he was disappointed with the sentence. Gonzalez-Angulo did not have any visible reaction after the sentence was announced. Hollingsworth said she was "incredibly upset" and emotional when he spoke with her after she had been taken into custody. Hollingsworth said he anticipates that as a result of her conviction, Gonzalez-Angulo will lose her medical license. "The medical world has lost a shining star today," he said. Defense attorneys had hoped that Gonzalez-Angulo's work treating patients and as a cancer researcher would have swayed jurors to keep her out of prison. "She saved my life and the lives of so many other people," Silvia Pubchara, one of Gonzalez-Angulo's former patients, said after the sentence was announced. "It was heartbreaking for me to see her placed in custody and taken to jail. She doesn't deserve it." Gonzalez-Angulo will have to serve at least five years before being eligible for parole. Keiter said Gonzalez-Angulo has no one to blame but herself. "Our society ... should be more angry at her for taking herself away from all those (patients) who she could have done amazing things for," the prosecutor said. Blumenschein and his girlfriend, who were in the courtroom when the sentence was announced, left the courthouse without speaking to reporters but, reports CBS Houston station KHOU-TV, said through prosecutors they were pleased the jury's decision. "They were happy," said prosecutor Nathan Hennigan. "At least they can sleep easy for the next 10 years while she's incarcerated." Last week, Blumenschein testified that his lifespan was shortened by the poisoning as he now has only 40 percent of his kidney function. The trial, which began Sept. 15, was filled with plot twists that could have come from a soap opera, including prosecutors saying that Gonzalez-Angulo lied about being attacked outside her home in an effort to get Blumenschein to leave his girlfriend. Prosecutors also said Blumenschein secretly recorded calls in which he tried to get Gonzalez-Angulo to confess to poisoning him. Blumenschein told jurors he became sick on Jan. 27, 2013, not long after he and Gonzalez-Angulo had been intimate, and that he immediately suspected his lover of spiking his coffee. Witnesses testified that Gonzalez-Angulo had access to ethylene glycol at the University of Texas M.D. Anderson Cancer Center where she and Blumenschein worked. Gonzalez-Angulo's attorneys had argued during the trial that other people, including Toney, might have been responsible for the poisoning, an allegation that Toney denied. Toney says she and Blumenschein are working on their relationship. Defense lawyers say they plan to file an appeal.